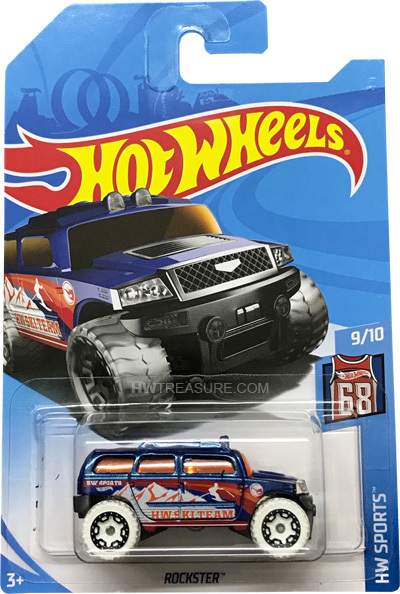 FKB23 is a 2018 Treasure Hunt and 9/10 in the HW Sports series. The blue SUV features red, orange, and white graphics of a mountain, a snow skier, and stripes. “HW Sports”, “HW Ski Team”, the Hot Wheels logo, and the low production symbol also decorate the sides. The car has orange windows, a chrome interior, white Off-Road 6-Spoke wheels with black rims, and a black plastic base. 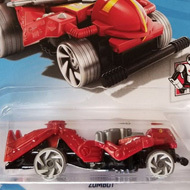 This vehicle can be found in mix “F” of 2018 Hot Wheels mainline cases. The Rockster made its debut in the 2004 First Editions series. 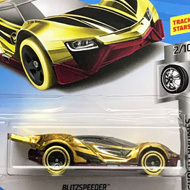 This is its second appearance as a T-Hunt and was previously in the 2008 set.